For nearly forty years the idea of the Holy Alliance, the Concert of Europe which arose out of it, and the series of congresses and conferences that succeeded the concert, kept an insecure peace in war-exhausted Europe. Two main things prevented that period from being a complete social and international peace, and prepared the way for the cycle of wars between 1854 and 1871. The first of these was the tendency of the royal courts concerned, towards the restoration of unfair privilege and interference with freedom of thought and writing and teaching. 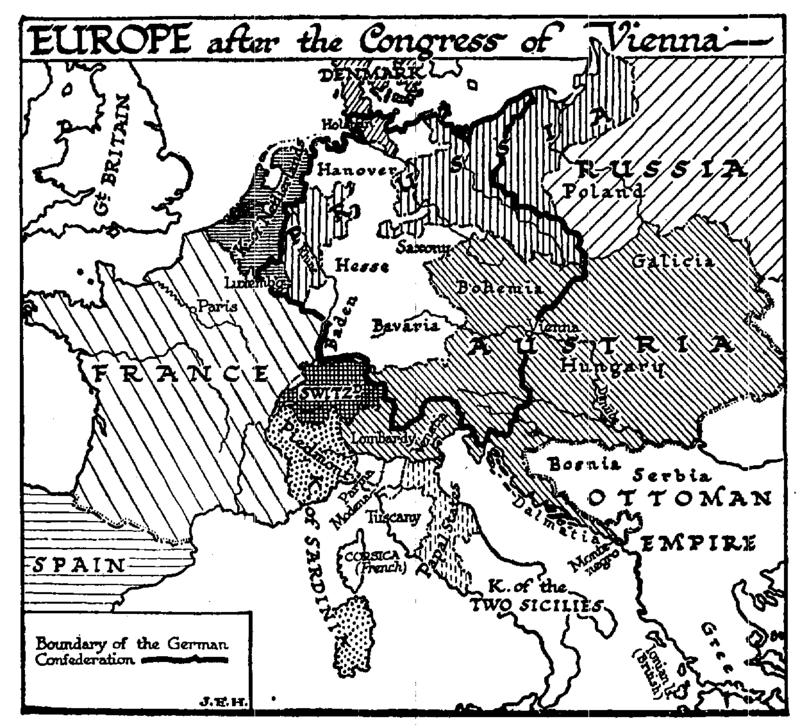 The second was the impossible system of boundaries drawn by the diplomatists of Vienna. The obstinate disposition of Monarchy to march back towards past conditions was first and most particularly manifest in Spain. Here even the Inquisition was restored. Across the Atlantic the Spanish colonies had followed the example of the United States and revolted against the European Great Power system, when Napoleon set up his brother Joseph upon the Spanish throne in 1910. The Washington of South America was General Bolivar. Spain was unable to suppress this revolt, it dragged on much as the United States War of Independence had dragged on, and at last the suggestion was made by Austria in accordance with the spirit of the Holy Alliance, that the European monarchs should assist Spain in this struggle. This was opposed by Britain in Europe, but it was the prompt action of President Monroe of the United States in 1823, which conclusively warned off this projected monarchist restoration. He announced that the United States would regard any extension of the European system in the Western Hemisphere as a hostile act. Thus arose the Monroe Doctrine, which has kept the Great Power system out of America for nearly a hundred years, and permitted the new states of Spanish America to work out their destinies along their own lines. But if Spanish monarchism lost its colonies, it could at least, under the protection of the Concert of Europe, do what it chose in Europe. A popular insurrection in Spain was crushed by a French army in 1823, with a mandate from a European, congress, and simultaneously Austria suppressed a revolution in, Naples. The moving spirit in this, conspiracy of governments against peoples was the Austrian statesman, Metternich. In 1824 Louis XVIII died, and was succeeded by that Count d’Artois whom we have seen hovering as an emigre on the French frontiers in 1789; he took the title of Charles X. Charles set himself to destroy the liberty of the press and universities, and to restore absolute government; the Bum of a billion francs was voted to compensate the nobles for the château burnings and sequestrations of 1789. In 1830 Paris rose against this embodiment of the ancient regime, and replaced him by the son of that sinister Philip, Duke of Orleans, whose execution was one of the brightest achievements of the Terror. The other continental monarchies, in face of the open approval of the revolution by Great Britain and a strong liberal ferment in Germany and Austria, did not interfere in this affair. After all, France was still a monarchy. This young man, Louis Philippe (1830-48), remained the constitutional king of France for eighteen years. He went down in 1848, a very eventful year for Europe, of which we shall tell in the next chapter. Such were the uneasy swayings of the peace of the Congress of Vienna, which were provoked by the reactionary proceedings to which, sooner or later, all monarchist courts seem by their very nature to gravitate. The stresses that arose, from the unscientific map-making of the diplomatists gathered force more deliberately, but they were even more dangerous to the peace of mankind. It is extraordinarily inconvenient to administer together the affairs of peoples speaking different languages and so reading different literatures and having different general ideas, especially if those differences are exacerbated by religious disputes. Only some strong mutual interest, such as the common defensive needs of the Swiss mountaineers, can justify a close linking of peoples of dissimilar languages and faiths; and even in Switzerland there is the utmost local autonomy. Ultimately, when the Great Power tradition is certainly dead and buried, those Swiss populations may gravitate towards their natural affinities in Germany, France, and Italy. When, as in Macedonia, populations are mixed in a patchwork of villages and districts, the cantonal system is imperatively needed. But if the reader will look at the map of Europe as the Congress of Vienna drew it, he will see that this gathering seems almost as if it had planned the maximum of local exasperation. It destroyed the Dutch Republic, quite needlessly, it lumped together the Protestant Dutch with the French-speaking Catholics of the old Spanish (Austrian) Netherlands, a rid set up a kingdom of the Netherlands. It handed over not merely the old republic of Venice, but all of North Italy as far as Milan to the German-speaking Austrians. French-speaking Savoy it combined with pieces of Italy to restore the kingdom of Sardinia. Austria and Hungary, already a sufficiently explosive mixture of discordant nationalities, Germans, Hungarians, Czecho-Slovaks, Jugo-Slavs, Rumanians, and now Italians, was made still more impossible by confirming Austria’s Polish acquisitions of 1772 and 1795. The Polish people, being catho lic and republican-spirited, were chiefly given over to the less civilized rule of the Greek-orthodox Tsar, but important districts went to Protestant Prussia. The Tsar was also confirmed in his acquisition of the entirely Alien Finns. The very dissimilar Norwegian and Swedish peoples were bound together under one king. Germany, the reader will see, was left in a particularly dangerous state of muddle. Prussia and Austria were both partly in and partly out of a German confederation, which included a multitude of minor states. The King of Denmark came into the German confederation by virtue of certain German-speaking possessions in Holstein. Luxembourg was included in the German Confederation, though its ruler was also king of the Netherlands, and though many of its peoples talked French. Here was a crazy tangle, an outrage on the common sense of mankind, a preposterous disregard of the fact that the people who talk German and base their ideas on German literature the people who talk Italian and base their ideas on Italian literature, and the people who talk Polish and base their ideas on Polish literature, will all be far better off and most helpful and least obnoxious to the rest of mankind if they conduct their own affairs in their own idiom within the ring fence of their own speech. Is it any wonder that one of the most popular songs in Germany during this period declared that wherever the German tongue was spoken, there was the German Fatherland? An outbreak of the natural political map of the world, which occurred in 1821, ultimately secured the support of England, France, and Russia. This was the insurrection of the Greeks against the Turks. For six years they fought a desperate war, while the governments of Europe looked on. Liberal opinion protested against this inactivity; volunteers from every European country joined the insurgents, and at last; Britain, France, and Russia took joint action. The Turkish fleet was destroyed by the French and English at the Battle of Navarino (1827), and the Tsar invaded Turkey. By the treaty of Adrianople (1829) Greece wits declared free, but she was not permitted to resume her ancient republican traditions. There is a sort of historical indecency in a Greek monarchy. But a Greek republic would have been dangerous to all monarchy in a Europe that fretted under the ideas of the Holy Alliance. A German king was found for Greece, one Prince Otto of Bavaria, slightly demented, but quite royal he gave way to delusions about; his divine right, and was ejected in 1862 and Christian governors were set up in the Danubian provinces (which are now Rumania) and, Serbia (a part of the Jugo-Slav -region). This was a partial concession to the natural political map, but much blood had still to run before the Turk was altogether expelled from these lands. 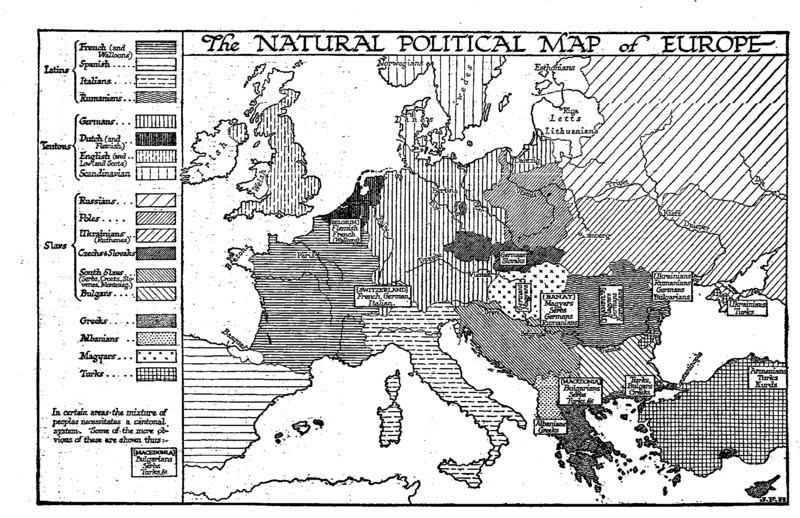 A little later the natural political map was to assert itself in Italy and Germany.